The Tshechu is festival honouring Guru Padsambhava – ‘one who was born from lotus flower’. This Indian saint contributed enormously to the diffusion of Tantric Buddhism in the Himalayan regions of Tibet, Nepal, Bhutan etc. around 800 A.D. He is the founder of the Nyingmapa, the ‘old school’ of Lamaism which still has numerous followers. The biography of Guru is highlighted by 12 episodes of the model of Buddha’s Shakyamuni’s life. Each episode is commemorated around the year on the 10th day of the month by ‘the tshechu’. The dates and duration of the festivals vary from one district to another but they always take place on or around the 10th day of the month according to the Bhutanese calendar. 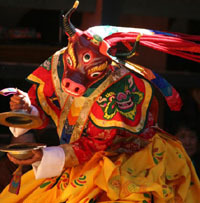 During Tshechus, the dances are performed by monks as well as laymen. The Tshechu is a religious festival and by attending it, it is believed one gains merit. It is also a yearly social gathering where the people, dressed in all their finery, come together to rejoice.